On a Grave Digging Mission - again! We in Kerala seem to have a genius for destroying our heritage so wantonly. How else could one explain the attempt to obliterate all traces of our history - this time by the local government? On a trip to Anjengo to trace the history of this early British settlement, I was curious to see the state of the few surviving monuments. Anjengo is an interesting case for many reasons. It was one of the earliest settlements of the East India Company built during the days when the Company was engaged in 'pure trade'. The world view of the Europeans was simple and was best expressed in the term -'peace and pagoda'. What remains of the Fort is well-maintained, thanks to the Archeological Survey of India. But the same cannot be said of other notable monuments. 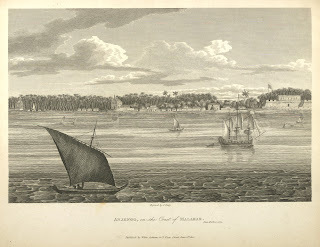 For instance, James Forbes, the author of Oriental Memoirs and the Chief of Anjengo Factory till 1772, has left an engraving of Anjengo as viewed from the sea. The engraving dated 1813 shows the English Cemetery on the beach, prominent with its tall white monuments. Julian James Cotton's compilation of 'List of Inscriptions on Tombs and Monuments in Madras' (1905) refers to this cemetery but records that thirty of the tombs had no inscription but 'one of them certainly marks the resting place of J. Whitehill, a relative of Eliza Draper.' Whitehill was the Chief of Anjengo Factory from 1759 to 1769. Cotton also lists two other tombstones - those of Mary Walker (1726) and of Anne Wrench (1773). Our team was led by Mr. Uday Balakrishnan, the Chief Postmaster General of Kerala Circle ( who was exploring the possibility of issuing a special commemorative stamp on Anjengo, which was one of the oldest postal sorting and distribution centres in India) and consisted of a dedicated team of Mr. Selvam and Mr. Mohanti from the Archeological Survey of India and Mr.
Gangadharan Pillai, the keeper of the Anjengo Fort. We spent hours looking for traces of this cemetery. At last, Pillai suggested that we look in the premises of the Anjuthengu Panchayat Office. The 60 cents of land which was designated as the Anglican cemetery had been taken over by the Panchayat long back. Locals remembered that in the process, they had uprooted many tombstones. We hoped those uprooted were the unnamed ones mentioned by Cotton and prayed that the three named ones were left in tact. Our search of the compound did not reveal any evidence of the plot ever having been a cemetery. There was none in the Panchayat Office who could give us more details. We had almost given up when Priya, the sprightly young clerk in the Matsya Bhavan office (which was also located in the Panchayat premises) pointed out to us a protruding piece of granite in front of her office. Could it be one of the tombs? It was, indeed,the tombstone of Anne Wrench, the beloved wife of P.E.Wrench who was the Chief of Anjengo Factory (1769-1774) after Whitehill. Anne lived to a ripe age of 87, an exception in times when the average life expectancy of a European in India was around 40. There was no clue, however, about the missing tombs of Mary Walker and J.Whitehill. What did the Panchayat do with those stones? More significantly, how did Anne Wrench escape the fate of the other stones? The latest addition to the Panchayat complex, pretentiously called 'E.K.Nayanar Memorial' had come close to encroaching on the only memorial left of the colonials - a prospect Nayanar would not have relished. But, then, how did the stone survive? Scarce any body is free from envy but in part. That everybody must follow her ere soon or late. To live and be like her may wish to be their fate. We have separately taken up with the Panchayat leadership and the Tourism department of the state on the need to preserve this and other monuments in Anjengo. Tourism is the only sure means of economic stimulus for Anjuthengu and villages around, due to the decline in the demand for coir products. And they have the 'product' with them. All they need to do is to preserve it and market it! While I can understand the disregard shown to tombs by these callous government babus I wonder why they do not do these things in a proper way. At least they should show some consideration to that little history which could have been preserved. Uprooting tombstones is not the way to go about development. But well, in a way I guess it has happened everywhere. Issue of Graves have become very grave Vandalising graves is heaping insult on our culture and the souls of the departed souls. We as a nation should improve the “Sense Of History”. Can any thing be done about it ? One other thing we break by such acts is trust - look at it this way. if an Indian dies outside India, we do our best to get that body back to where he belonged and then do the funeral pyres. if an Englishman has been buried in India, a certain amount of trust had been placed by the family in our land and its people to 'allow the soul to rest in peace'.Sad state of events...to say the least. Thank you, Maddy, for your very perceptive commment.One had not thought from that point of view. At the same time, one cannot but be a bit cynical of the drama that goes on in the name of bringing the Indian dead home. In most cases, it is the vote of the Indian living that eggs the politician on to arrange for this. Beyond nationality, it is our duty to respect the dead and that is part of human civilisation. Mutilating the grave is as heinous as mutilating the dead body. Here lyes DEBORAH, the wife of JOHN BRABOURN, Esquire, commodor of Anjengo. She was born the 4 of November 1676, married the 25 of September 1695, deceased Sept. the 2 1704. It was John Brabourn who in 1693 had been sent by the Company as the emissary to the Rani of Attinga. She had authorised him to build the fort at Anjengo, and gave the Company a monopoly of the Attinga pepper trade. When she later changed her mind and tried to blockade the new fort it was Brabourn who had repulse her raiding parties. He left Anjengo in 1704 - the year his wife died. Four years later, his two little children also died and were buried at Madras. Thank you very much for going to find these graves, and for bringing them to peoples attention. I can understand that these graves must seem to most people in India to be an irrelevance, but to many of us, they are direct links to our heritage and past. Yup, heritage conservation in India is a bit of a mess. You might find my post on this subject interesting. I appreciate the tenacity of the group who went in search of the grave. The search has revealed yet another part of the History of common English people who had come to India facing many a perils. No doubt, the attitude of the authorities in neglecting the heritage resulting in its near extinction is most condemnable. At the same time can we find fault with them? History for most of us is the History of the Rajas, especially in India. Only recently the Rajas took a back seat in historiography. At the most we have tombs which are a common sight through out the North India. It is not as prevalent in the South, except in the kingdoms of Muslim rulers. Can we expect the authorities to preserve the grave of a commoner and that too of an old English woman? Our culture treasures the ashes to be safely disposed to the Ganges or the Arabian Sea. We preserve the memory of those who die an unnatural death. And they are more spiritual, but never historical. Probably this attitude attributes to the neglect that you saw there. I am sure your attempt would enlighten many the need in treating these heritages with some respect rather than with utter disregard. I realize that 6 years have passed since this dialogue. I am the founder of SIRA (South India Research Associates) and we are conducting a survey of all these monuments from the colonial era beginning in 1498 for all of Kerala that will be published this year. It's not merely a matter of mutual cultural respect and commoners - the history of Malabar is written upon these stones. Anjengo is difficult - as the factory there was abandoned as early as 1805. The burial ground was not within the fort but 200 yards to the north and was noted as 'subsided' as early as 1840. Recovery would be a very low cost 'dig' giving graduate students a field opportunity. There are amazing stories to be recovered there.